These two episodes of Gilmore Girls are better than the last two episodes of Gilmore Girls, because some things actually happen. Namely, Lane and Zack get married, and April throws a birthday party! Because we are where we in the GG saga, it’s all going to go down in the flames of hellfire, but at least there is some fun to be had before we get there. Lane and Zack’s wedding(s) bring us the Stars Hollow quirk we long for: people running across town to grab seats from the Koreans, Kirk setting up a mobile Yummy Bartender service, Zack performing in his marital robe with Hep Alien in front of the town’s trademark gazebo. Even with all that offbeat charm, it points out that there’s really nothing in town to do for a bachelor/bachelorette party, except for hanging out in Brian’s aunt’s rec room. And there’s a nice symmetry of Lane discovering that Mrs. Kim is as afraid of her own mother as Lane is of Mrs. Kim. Their hug at the wedding reception was sweet, even if I wish Mrs. Kim had hung around to twirl on the dance floor with Kirk or something equally nonsensical. Still, all is well, until Lorelai becomes so undone by her daughter’s picture with April that she decides to drink a gallon of tequila and have a public meltdown in front of the entire town because she believes that she and Luke will never in fact tie the knot. We’ve heard rumors of Lorelai’s Coyote Ugly-worthy drunkenness before, and we’ve seen her chug margaritas after her last final, I believe, and vodka with Digger. But this might be our first glimpse of drunken Lorelai the pathetic, and as with everything about the Luke-Lorelai unraveling, it’s more than a bit depressing. Even worse is that it opens that Christopher window a crack, which is all that guy needs to slither back into Lorelai’s life. "I Get A Sidekick Out Of You"/"Super Cool Party People"
And the hits just keep coming, as Luke tells Lorelai that she’s like a cartoon character, and that the real reason why he’s keeping her away from his daughter apart is that he’s afraid April will like her more than she likes him. Were we actually supposed to like this character at some point? Panicked over April’s flopping party, Luke is more than happy to beg Lorelai for the help he previously so rudely refused, and insists that she stay for the sleepover. And then throws Lorelai under the bus when Anna gets mad at him for it, even though none of this was Lorelai’s fault to begin with. As with last week, and Martha’s Vineyard, I just don’t get why she didn’t ditch him sooner. But at least April and her friends are cute, reminding us why Luke is so determined to be involved in his daughter’s life, but his petulant reasons to keep Lorelai away from her don’t add up. Oddly enough, Anna’s do, for the most part. Anna season six is much more reasonable than Anna season seven, and hearing her side, it makes sense that she would be a bit cautious about April’s bio dad’s girlfriend. But a few things stick out: Anna knows that Luke is a steady, steadfast guy, so there’s no reason to indicate that he would be dating a lunatic. And while engaged isn’t the same as being married, it’s certainly close enough for Anna to feel a little less panicky about the supposed flightiness of Luke’s relationship. But basically the plot device of April turns the wheels it’s supposed to, with this horrific situation all coming to a merciful end next week. I do hate, though, when they throw huge town things and some of the irreplaceable townies, like Taylor and Babette, just aren’t there for some reason. In other news, Logan fell down a cliff or something because he’s a goddamn genius. But Paris being able to parse the situation in a matter of moments is the best kind of Paris. We know that Mr. Kim just shows up as an aside in the revival, but was that him taking pictures outside of the church? 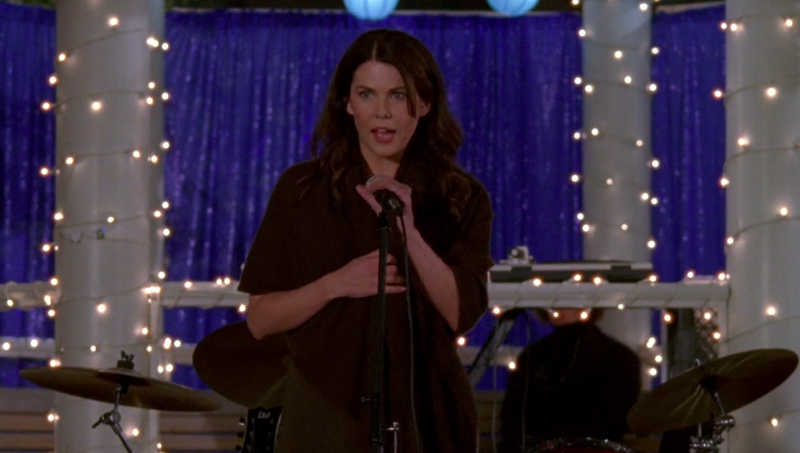 Best Gilmore Girls outfits: That dress Lorelai wore to the wedding was really pretty. But what’s with all the fancy brown and drab-colored dresses? Worst Gilmore Girls outfits: Just say no to tie-neck blouses. Back when “It was like being taught by Jimmy Kimmel” was kind of a dig. I know I was around then, but was the Sidekick like the first Twitter/texting mechanism? Like a Blackberry? “Sidekick” happens to be a great Michel episode. “What should I wear? What would Celine like me in?” Also, “I’ll bring you a mouse pad, bu-bye.” Also, I would watch him dance for hours probably. Where was Gigi during all of the late-night wedding antics? I like how dorky Rory’s toast was. I believe Rory speaks for everyone when she tells Colin and Finn that they’re useless and she can’t stand to look at them. And her takedown of Mitchum was well-done. Luke calls the night before and then arrives in time for Lorelai’s hangover the next day? How did I never notice that Paris is left-handed? Next week: We go from season five’s finale proposal to some sort of horror-movie ending for season six. Why did Gilmore Girls’ Lane and Zack get such a raw deal?